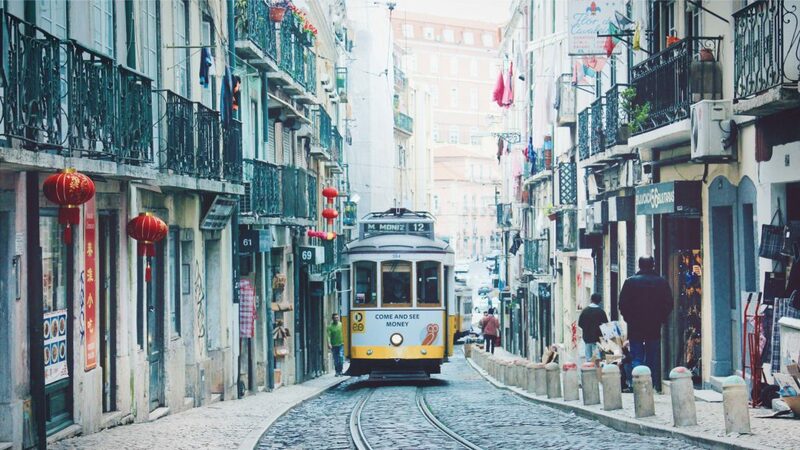 The colourful city of Lisbon is as vibrant as it is historic. While there are many impressive sites and monuments to see, the city also has many hidden gems and quirky spots worth exploring. To help you discover the alternative side of Lisbon, we’ve put together a list of the top 10 unusual things to do there! Due to the city’s unique location, Lisbon is famous for its beautiful sunsets. While there are a great many spots to watch the sunset, we recommend joining the locals at one of the many hilltop viewpoints, or “miradouros” as they are called. Your pictures will be nothing short of scenic. The beautiful coastal town of Cascais, only half an hour away from Lisbon, is the perfect place for exploring Portugal’s coast by bike. Bicycles are cheap to rent, vastly available and the bicycle trail goes on for kilometres! Feel the breeze in your hair and enjoy the beautiful ocean views. You don’t have to be crazy about animals to enjoy a dolphin-watching experience in Lisbon. Hop on a boat to see dolphins swim around in their natural environment. See them jump and play and listen to their beautiful calling sounds. It’s as exciting as it is therapeutic. Not all art is found in galleries and museums. The city of Lisbon is famous for its beautiful street art that lends the city an unparalleled energy and vibrancy. See entire buildings covered with extraordinary illustrations and large-scale mural installations that give joy and character to the city centre. The Feira da Ladra, which literally translates to Thieve’s Market, is Lisbon’s famous flea market, loved by locals and visitors alike. The market spans over several streets of Lisbon’s historic district, Alfama. The district, which ordinarily looks charming with its winding cobbled streets, looks even more spectacular with rows of colourful stalls and one-of-a-kind trinkets. The market is on every Tuesday and Saturday giving you ample opportunity to lose yourself in the search of unique findings. No, this isn’t a typo. The Hospital for Dolls, or otherwise the Hospital de Bonecas, is a family-run shop offering repairs for dolls. This unique shop caters to doll-patients of all kinds, from those needing an arm replacement to those needing a full-blown makeover. Not your ordinary tourist site. This ancient drowned village is definitely a sight to see. The village is only visible when the dam levels drop, meaning that, the rest of the time, the village is completely covered with water. The 2000-year old town disappeared under water when an Electric Company made the decision to build a dam that would flood the area. Against all odds, this historical village still stands (albeit in ruins). If you don’t catch the village on a good day you can explore it from above, abroad a glass-bottom boat. While a visit to the Pena Palace is a must for anyone travelling to Lisbon, add a unique spin to your visit by going there with a local. Located in Sintra, the Pena Palace stands as the ultimate example of romantic architecture. Take advantage of the opportunity to explore it with a local who can give you unique information about the Palace’s rich history as well as insider tips on what to do in Sintra. Sneeze and you’ll miss this teeny-tiny bookstore, no bigger than a shoe cupboard. Located at the beginning of the Conceição stairs, the bookstore will impress you with its collection of over 3000 books in just 4 square metres! Tram 28 might be Lisbon’s most iconic mode of transportation, but have you ever explored old cobbled streets abroad a Tuk Tuk? 3 wheels and twice the fun! Check out LocalBini for more unique things to do in Lisbon!